Organized by Overnet, in collaboration with Microsoft, WPC is the most important italian conference focused on Microsoft technologies. This year it will be covered in two full immersion days on December 1st and 2nd with 70 sessions in 8 tracks. I’m honoured to be part of the speakers team this year as Microsoft MVP on Windows Embedded and IoT; on December 2nd, I’ll have a session about Microsoft Azure IoT Hub with an overview of the new Azure cloud gateway and the related Azure IoT Suite. For sure, the conference will be great for contents and networking with all experts about Microsoft technologies. Don’t forget the “Ask The Expert” corner with a “bunch” of Microsoft MVPs ready to answer your questions. All information and details about the registration and the conference on the official web site. Today, thanks to the Microsoft Azure IoT Hub we can focus on developing our Internet of Things “end to end” solution at an application level perspective without concerning about the communication problems, the interconnection and messages exchange between the devices and the service backend. Before the advent of the IoT Hub we needed to setup all the communication channels to achieve the bidirectional paths from/to devices to/from Cloud. In that scenario, the best choice could be to use the Microsoft Azure Service Bus with Queues, Topics/Subscriptions and Event Hubs instances. In the next paragraphs I’ll try to imagine (at very high level) what the IoT Hub service provides internally for us and how it sets up all the mentioned channels; we could mimic the related architecture using a bunch of Service Bus entities. During my explanation, I’ll use terms like “may” and “should” because I don’t know how it works for real, I can only imagine it and thinking as I need to implement it from scratch. 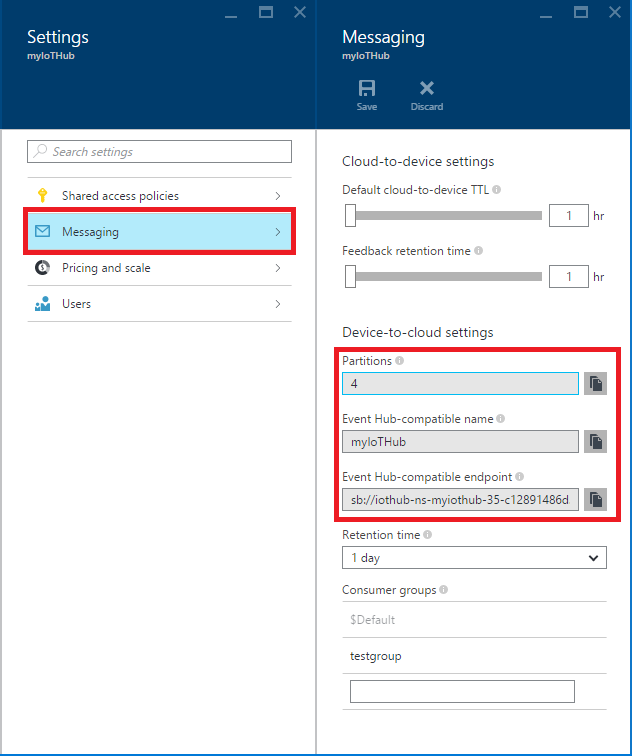 I consider this post as a conclusion of my previous “trilogy” on how to connect to the Azure IoT Hub using an AMQP stack, that is useful to understand how it works internally; these articles covered how to connect from a device perspective, how to handle command and feedback and finally how to get telemetry from devices. The first “simple” path we need to setup for an IoT solution is the telemetry one related to messages flow from devices to the Cloud without any response or feeback in the opposite direction. To support the ingestion of million events/second the IoT Hub “should” use an Event Hub like mechanism and it “may” be true because the D2C endpoint (at the service side) is defined as “Event Hub compatible” and we can read from it using a “pure” Event Hub client (like “low level” Event Hub Receiver or “high level” Event Processor Host). and the same node is exposed as “Event Hub compatible” at D2C endpoint at Cloud side (as already mentioned at this blog post). The related information ar available on the Azure portal to build the endpoint connection string. It should be clear that the telemetry path is achieved using an Event Hubs like channel. For handling commands from service to device, we need a channel for sending them and another one to receive feedback about their delivery (accepted, rejected, expired, …). The command path “should” be a queue on both sides (devices and service) with a related TTL (time to leave) and dead letter queue for expired or rejected messages by devices. As we can see, the sending path “/messages/devicebound” hasn’t any information about the target device. To do that, the service need to set the To AMQP system property to the following value. An internal mechanism “shoud” route the command to the right queue related to the destination device analyzing the message and reading the above To property. It means that the internals “shoud” provides a queue on service side for sending commands and a queue for each device for receiving them. In this case, the device information related to the feedback are inside the body of the message itself in JSON format as described in the following post. In this case, the feedback path “should” be implemented with a queue on service side. As you can see, the IoT Hub “should” provision a bunch of “Service Bus – like” entities for us inside a unique namespace related to the IoT Hub itself. Before this new services, we needed to setup all the event hubs and queues instance by ourselves … today IoT Hub provides the entire architecture. As I said … it’s only my imagination but … a possible high level solution to implement IoT Hub internally. 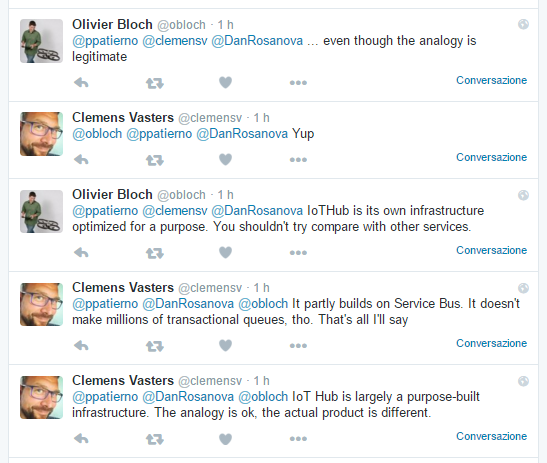 It’s only an analogy game with a “home made” solution as you can see from the following Twitter conversation about this post by Clemens Vasters and Olivier Bloch from Service Bus and IoT Hub teams in Microsoft. For all italians people (or all my foreign friends who can understand italian ;-)) I’d like to announce another podcast about the Internet of Things on DotNetPodcast. This is my third podcast on this stuff and I want to thank the DotNetPodcast team (Roberto Albano, Antonio Giglio, Massimo Bonanni) who invited me another time. It’s a pleasure for me. This time I speak about the new Microsoft Azure managed service for the IoT world : the IoT Hub. Why the need for the IoT Hub, what are its main features, connectivity and supported protocols, security, SDKs and certified hardware and how it fits well in an end to end IoT solution built using the Azure IoT Suite. Finally a brief comparison with the competitor AWS IoT from Amazon. These are the main points of my chat that you can find here.